Go kale! 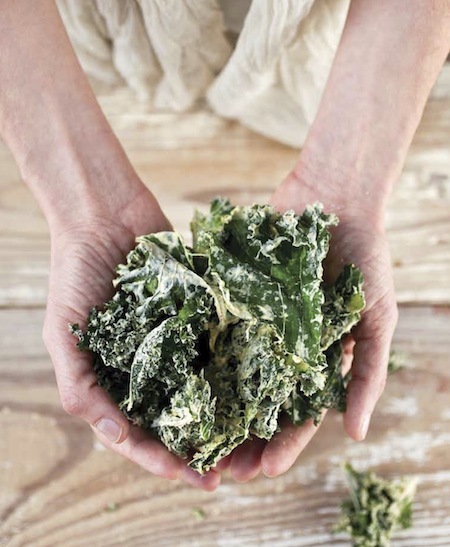 Kale Chips (crispy wisps of the dehydrated leafy green) are now all the rage. The concept is pretty simple: cover the kale in thick cream made from nuts and seeds or olive oil and herbs, and dehydrate until crisp. 1. Remove kale ribs (save for juicing or just eat whole as crunchy snacks). Tear the leaves into large pieces, approximately the size of your palm. Wash thoroughly and spin dry. 2. Drain cashews. In a high-speed blender, blend with the remaining ingredients. The final product should be smooth and creamy and resemble a thick dressing. In a large mixing bowl, thor- oughly coat the kale pieces with the cream. 3. On a dehydrator tray fitted with teflex or parchment paper, place coated kale, leaving enough room for air to circulate around them. For this recipe it’s best to have at least a full 9-tray dehydrator to accommodate all the chips, skipping every other level so the chips do not get crushed. 4. Dehydrate overnight for at least 13 hours until kale pieces are crisp and light. 5. They will keep in an airtight container for a week at room temperature.